History of The O. J. Hammell Co.
"The Master Craftsmen of the East"
and will include a reenactment of the tea burning, tall ships, and more. You can find more information here on the Cumberland County Historical Society web site. in 1867 for the manufacturer and sale of memorials and monuments to the public. The business continued to grow to include sales offices in 58 cities east of the Mississippi River. reputation within the industry, and the satisfaction of their customers backed up the claim. potable water as well as water for irrigation and cutting and finishing operations in the factory. The previous water tower built in 1902 can be seen in photos of the shops and factory. The text below is copied from one of the Hammell Company brochures published in the 1930s. Realizing their debt to posterity, "Hammell master craftsmen" for three generations have handed down an art in Memorials, that is both inspiring and everlasting. Our long and successful record as an institution in this field proves the soundness of our policies of integrity, careful thought and sincere service. The modest, inexpensive headstone, the family monument or the most elaborate memorial, either public or private, demands and obtains our careful and thoughtful attention, and we respectfully state that we would enjoy your patronage, whatsoever might be your needs. The first shop was located in a small building on Cherry Ct. behind what is now the main office of the First National Bank of Absecon. As business grew operations were moved a few years later into a former bank building located on the corner of Shore Road and West Jersey Ave. near the Pleasantville Rail Station. By 1902 business had grown considerably and a new showroom, offices, and factory space were built about 1.5 miles away in the (then) new Atlantic City Cemetery in Pleasantville, NJ. The Hammell Company property was located in the center of the Atlantic City Cemetery, an area bounded by the Black Horse Pike (Rt. 40), Washington Avenue, New Road, and Doughty Road. O. J. Hammell was one of the principals in formation of the Atlantic City Cemetery Association and he secured a piece of property in the center of the cemetery tract which was an ideal location for his monument business. The Hammell company built many of the great war memorials that stand up and down the east coast of the United States. Monuments such as the New Jersey memorials at Gettysburg and Valley Forge, the Chestnut Neck Battle monument in NJ, the Greenwich Tea Burning Party monument in Greenwich, Cumberland County, NJ and countless municipal war memorials in cities and towns everywhere across New Jersey, Pennsylvania, and neighboring states. In addition to building these monuments to commemorate historical events, the Hammell Company also manufactured markers, monuments, and mausoleums for purchase by the public to memorialize the passing of beloved family members and friends. Although the Hammell factory [was]1 well known throughout the country as extensive builders of large public memorials and costly mausoleums, they never the less devote a large part of their factory space to the production of inexpensive memorials for the family of moderate means. Manufacturing several thousand monuments per year, that cost from $200 to $900 each, set complete on a cemetery property by our own factory trained experts, has created a volume of business that enables us to offer the lowest possible prices consistent with the use of the most durable materials. 1 The O. J. Hammell Company is no longer in business, I have replaced present with past tense in any text copied from Hammell Company documents which might mislead someone into thinking the company is still in operation. 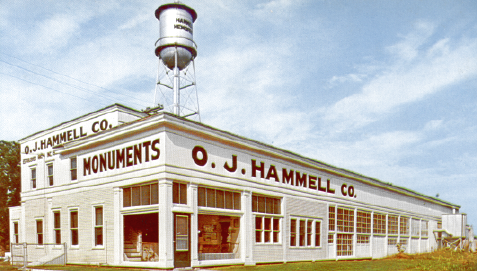 The O. J. Hammell Company, Inc. was bought out by another monument company from Philadelphia in 1968 and was eventually closed a few years later. The last remaining office, the water tower, and the factory, all located in Pleasantville, NJ were later torn down around 1974? (exact year unknown). The purpose of this web site is only to provide historical information about the monument company operated by my family from 1867 to 1967. If you have questions or information that might add to this site you are welcome email me.